Orange Is The New Black Season 5 release date: The season five of the OITNB will release soon. As we have seen in the season 4, Piper chapman along with the other Litchfield prison inmates are in the life threatening situation as things descended into chaos at the end of the installment. Silencing all rumors and anticipation Netflix is coming with new series, which will take place for over three days. What is ‘Orange Is The New Black’ TV Series? 1 What is ‘Orange Is The New Black’ TV Series? It is recorded as one of the most watched series on Netflix. It is a comedy drama by Jenji Kohan, which was first released in July 2013, and since then its popularity is increasing day by day in the UK. Check: Log Horizon Season 3 News & Updates. The story is oriented towards a privileged person of the NYC viz. Piper Chapman, who gets arrested on the charges of being a drug runner 10 years earlier. This new series named OITNB: My Year in a Women’s Prison tells the life-story of Piper Kerman. Till now, this show has been nominated 16 times for Emmy Award out of which it won four Emmys. The s5 will hit the screen on June 9, 2017, with 13 episodes. To watch this series online, you must have Netflix account as this will only available on Netflix. The basic subscription cost is 5.99 euros which will be free for the first month and it can be canceled at any time, later on. The s4 ends with the riot when Poussey’s accidental killing. Inmates also had involvement in these riots. Judo King run out of prison and hence, chaos happened at hallways, eventually Litchfield also marched to the hallways and get descended. Prison guard Humphrey was pushed and in this he loose his safety gun which slides over to the Hispanics which is picked up by Daya. Everyone ask Daya to shoot Humphrey. Last season of the OITB ended giving us more excitement to watch 5th installment. All eyes are on the Daya who has gun heading towards the Humphrey but now it is crystal clear that situation for the Litchfield will change forever. Season 5 of the series will be take forward the scene of prison’s hall which will decide the future of those inside and outside the gates. Update: A new promo has been released. 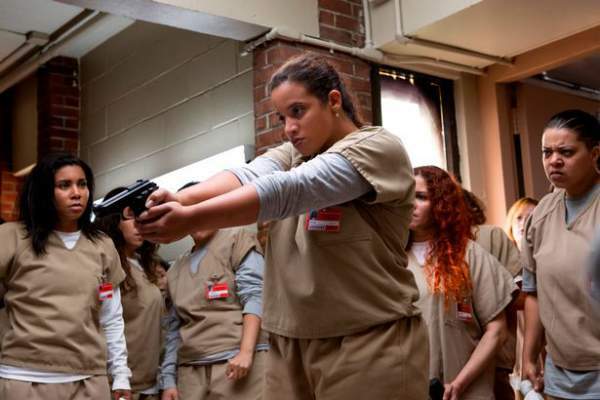 The three-minute clip released by the Netflix showing Dayanara “Daya” Diaz (Dascha Polanco), pointing a gun to the male guard, Humphrey. The mob asks her to shoot Humphrey in the head. Piper Chapman can flee out of the scene to stay away from trouble. Later, the screen becomes black and we heard the gunshot but still, it is not clear that who has been shot and who fired a gun.